On Match Day 2017, Friday, March 17, graduating medical students participating in the National Residency Match will simultaneously learn where they are going for residency training. Medical schools in various time zones synchronize giving out individual match announcements to their students with the noon EDT lift time. The National Residency Matching Program expects the 2017 Main Residency Match to be the largest in history. It will likely exceed the more than 42,000 applicants who registered for the 2016 Match. Over 4,800 residency programs at institutions across the United States offered more than 30,000 positions last year. Residency training, also called graduate medical education, prepares those who have recently earned an M.D. degree for particular fields of medical practice. Depending on the specialty, training takes three to five years. It can be longer for trainees in subspecialties. The transition from medical school to graduate medical education is rite of passage for physicians-in-training. Students look forward to the results of their residency match with eager anticipation and excitement, or even a slight case of the butterflies. On this day, many seasoned physicians distinctly recall how they felt on their own Match Day. Medical schools make the announcements a special event so students can share the occasion with family, friends and faculty and staff mentors. In keeping with this tradition, the University of Washington School of Medicine and its training sites in other states mark the presentation of residency match results with special ceremonies or other sorts of celebrations. At the UW medical campus, a gong is sounded at the start of Match Day festivities. Applicants quickly find out their placement notification through an announcement envelope, or through an app on their mobile devices. Pandemonium ensues as students alert their friends and families. The event is dubbed Match Day after the placement program run by the National Resident Match Program. Usually beginning in the fall of their last year of medical school, students apply to the residency programs. The program directors review and interview applicants. Early in the year, applicants submit their rank-ordered residency preferences to the National Resident Match Program. In turn, program directors rank applicants. A computerized mathematical algorithm matches applicants with programs based on mutual preferences on the ranked lists. Monday of Match Week, March 13 to 17, all participants learned whether a match was made. Those who matched obtain their placement results on Friday. Those who are unmatched seek a position during the Match Week Offer and Acceptance Program. The national and regional results reported from the Match are examined by health-care researchers for insights into the specialty interests of new M.D. graduates and into the future makeup of the U.S. physician workforce. WWAMI is a regionalized, decentralized medical education program in Washington, Wyoming, Alaska, Montana and Idaho. The program is a key reason why many UW medical school graduates decide to enter training in fields facing workforce shortages. These include the primary-care fields of family medicine, general pediatrics, and general medicine. Last week the UW School of Medicine was once again ranked by U.S. News & World Report as the nation's top medical school for primary-care education and for teaching family medicine and rural medicine to medical students. Follow the Match at #Match2017 and #HuskyMatch. 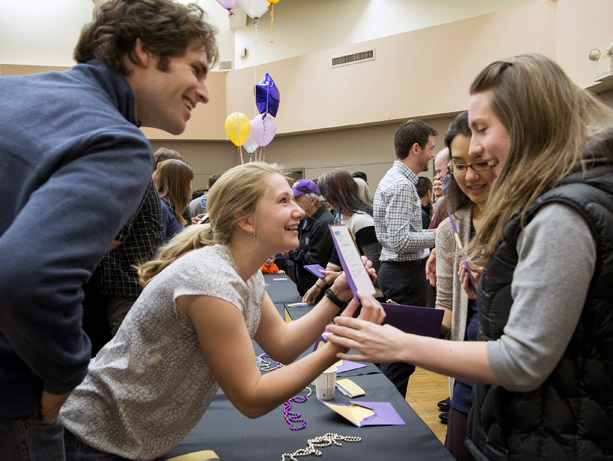 Check the @UWMedicine Twitter just before 9 a.m. PDT, Friday, March 17, for a live Periscope look at the UW School of Medicine Match Day ceremony.